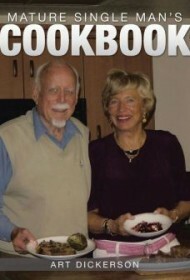 This earnest cookbook has one purpose: to help older men learn to cook meals that will satisfy their entertaining needs, especially if they’re trying to cultivate a “lasting relationship with a lady.” There are slicker offerings with more recipes, to be sure, but there are none as well-meaning as this. In the section on “Dinner for Two,” for instance, Dickerson advises that the house must be spotlessly clean. “This is your introduction of the lady to your home,” he writes. The recipes are clear and straightforward, some with as few as three ingredients. The author makes liberal use of canned and brand name packaged goods, which simplifies many of the recipes. The Chocolate, Pistachio and Kiwi Pie, for instance, is made with two flavors of Jell-O pie filling, kiwi fruit, and a prepared graham cracker crust. The author also includes more complicated fare, such as a Florentine Scallops and Faux Crab Casserole with Asparagus Wrapped in Prosciutto that requires a homemade bechamel (white) sauce. The cookbook suffers from a few technical issues. The ingredients aren’t necessarily in the order they appear in the recipes and there is no recipe index. The few pictures lack the styling finesse to make the dishes appear tantalizing. Still, Dickerson’s obvious pleasure at sharing his cooking skills and wisdom will take the budding “mature” cook on a soul-satisfying cooking adventure.